I love subscription boxes, especially ones for my kiddos. So when I had the opportunity to try out Kids' Candor, I of course jumped at the chance. 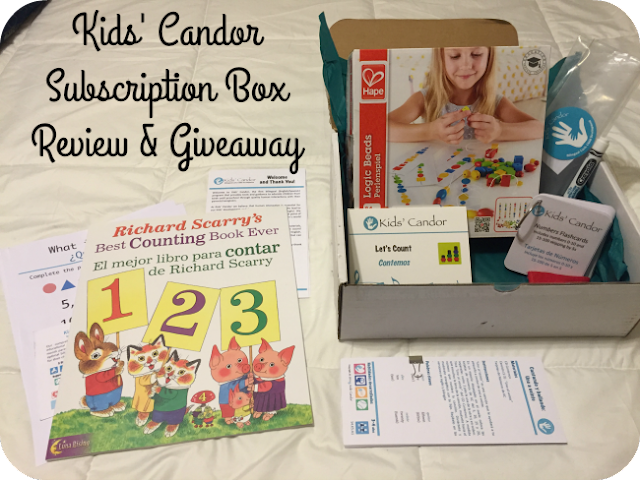 What make Kids’ Candor unique is the fact that it is the first bilingual (English/Spanish) program that provides tools and guidance to educate children from birth until preschool through quality human interactions with their parents/caregivers. 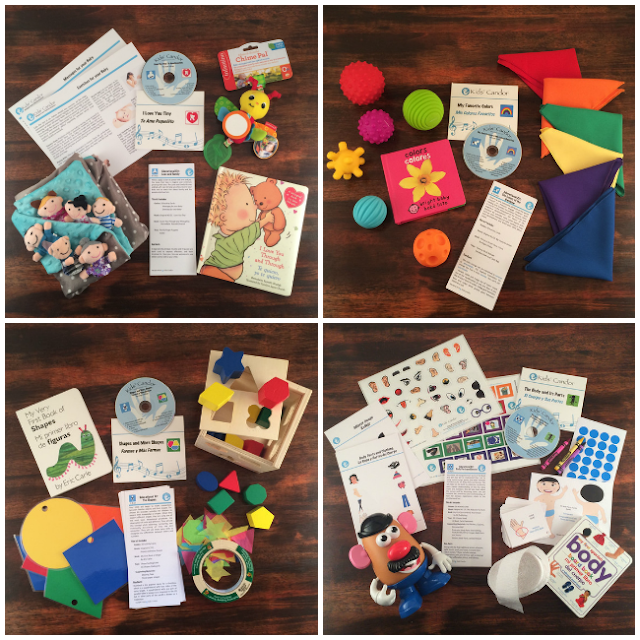 Every month you will receive one kit with everything you need to foster an optimal early child development. Each kit is specifically crafted for your child’s age and development stage. Their comprehensive curriculum encompasses original music, educational activity materials, games, toys, and easy-to-use guide cards. Finding educational games where my child can actually learn, but I don't have to run around to a million different stores to find all the right stuff is hard. But Kids' Candor has taken out all the leg work for you. One lucky Nanny to Mommy reader will win a Kids' Candor Full Version Subscription Box of age choice. RV $45. Entry is simple, just follow the prompts on the Rafflecopter below. Open to US/Can only, must be 18+ to enter. Make sure to follow us on Facebook so you can stay up to date with our current giveaways. Good luck! Thank you for stopping by the Hop Into Spring Giveaway Hop! Hosted by The Anti-June Cleaver and Our Piece of Earth. Spring is just around the corner and it's time celebrate warmer weather and longer days! We have teamed up with an amazing group of bloggers to bring you a bunch of great prizes to get you in the mood for fun and sunshine. As always, after you have entered a giveaway visit the linky at the bottom of each post to visit the other blogs for more great prizes. Nanny to Mommy received complimentary products to provide this post. Nanny to Mommy is a Kids' Candor affiliate which means we make a small commission when you purchase from our links. All opinions are our own. 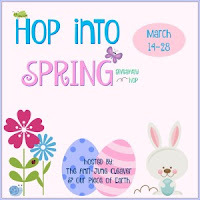 Hop into Spring participating bloggers are not responsible for sponsors who do not fulfill prize obligations. Nanny to Mommy received complimentary products to provide this review and giveaway. Nanny to Mommy is not responsible for sponsors who do not fulfill prize obligations. This giveaway is open to US/Can only, must be 18+ to enter. Cannot be shipped to P.O. boxes. One entry per household/IP address. No social media was involved in this giveaway in any way. Winner is chosen via Random.org through Rafflecopter. ALL winning entries ARE verified. Winner will have 48 hours to respond with all information in email or another winner will be chosen. If you would like to see your product featured in our upcoming Baby Shower Gift Guide or sponsor a giveaway event, please contact us. I really like the Farm Animal kit. We live in the country and these would be useful. I have basic knowledge of Spanish from school, but it would be good to start my daughter early, since her cousin is being raised bilingual. :) I like that it is hands on to teach. I would like the 6 to 12 month kit! I teach world languages so I know what a great resource this is! I love any of the 6 to 12 month kits. I teach world languages (Spanish and German) and I know these would be great resources for my daughter at home! I would love the age 2-3 year subscription kit!! That would be amazing to use with my youngest daughter!! I love that its a bilingual kit!! So awesome and important to teach your child another language!! I would love the 3+ kit! I have always wanted to raise my children in a bilingual home and have spoken with my husband about how we would do this. We are finally due with our first born this October and I'm so excited to have found this! We would need the 0-6 month subscription. Thanks so much for the opportunity and info! I like it because its themed and I like the move to music one. I love these educational kits because they offer fun while learning. I would choose the "My Feelings" Educational Kit if I were lucky enough to win. I think this program is great. I would love to get for my Grandchildren, I wish I knew other languages. I would love to get so they could get a head start from the early years to help them in later life. I love the thought put into it! so varied. Id love the numbers and patterns kit! I like the variety of items that are offered in each kit! I'd have to choose the "My Feelings" kit if I won! I love the fact that it slowly teaches the child about a secondary language. Something my grandchildren or for that matter , I really think every child should learn. I think the Move to the Music or the My Feelings box would be good for my daughter. I love introducing new languages early to my kids. I'd like to get the "Letters and Words" educational kit for my daughters. We've never done subscription boxes but this one looks suited to or interest/needs.